Hey, prime cycling weather is here, and Wigwam is adding a feature for all you Beacon Bicyclists, present and future! Every Friday we’ll do a bicycle-related post. Topics will include how to choose and equip a bicycle for riding about town, tips for riding in our local traffic and road conditions, options for riding with your kids, and lots more. 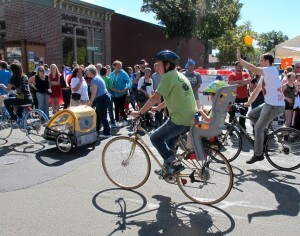 We’ll also bring back our Bike People of Beacon feature, quick Q & A’s with local folks getting about on two wheels. But first, we start off with a reminder to all of us, drivers, pedestrians, cyclists, to share our roads. Summer is here and more and more Beaconites are choosing to ride bicycles to go to the grocery store, the library, or one of the many fine restaurants in our little city. As an operator of both motor vehicles and bicycles for the last few decades, I would just like to remind us all to stay focused and share our roads. There are signs on a number of the entry roads into town that show an image of a bicycle followed by the words “IN LANE.” While they may lack a bit of clarity, they do not mean “Get the &^%#!! Off the Road! !” an interpretation I’ve heard twice in the last week while traveling south on 9D between the bridge and Main Street, where one of the signs is in plain sight. These signs are meant to remind drivers that they should expect to encounter bicycles fully in the travel lane. 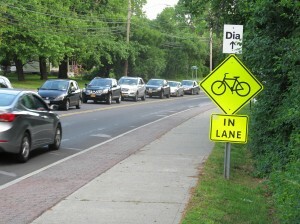 New York State law permits bicyclists to move into the lane when hazardous conditions are present on the shoulder or the right-hand portion of the lane, and of course Main Street has the “door zone” down its entire length, and good chunks of 9D (and Verplank) have high curbs and no marked shoulders. Cyclists should also heed the signs and take the lane, a safer option than traveling at any speed in the door zone or directly next to a foot-high curb. In one of the incidents where I was instructed to remove myself and my vehicle from the roadway, the poor guy was actually sitting in his vehicle heading in the opposite direction, waiting in traffic to cross the Newburgh-Beacon bridge. Just the thought of a bicycle on the road was enough to irritate him. Every time someone leaves their car home and takes a bike instead, that means less wear and tear on our roads. We save money in taxes devoted to infrastructure upkeep. While we may feel antsy driving behind a bicyclist on Main Street, we’re probably losing about the same amount of time overall as waiting for someone ahead of us to parallel park. And since the bicycle does not take up a parking space, we save time driving around looking for one at our destination. Bicyclists are someone we know. It’s that whole “degrees of separation” thing. Someone we care about rides a bike. Riding a bike saves us money. Cars are expensive to own and operate. Relatively speaking, bikes are practically free. The average car costs about $7,000 per year to keep on the road. Going from two to one would be a significant savings. 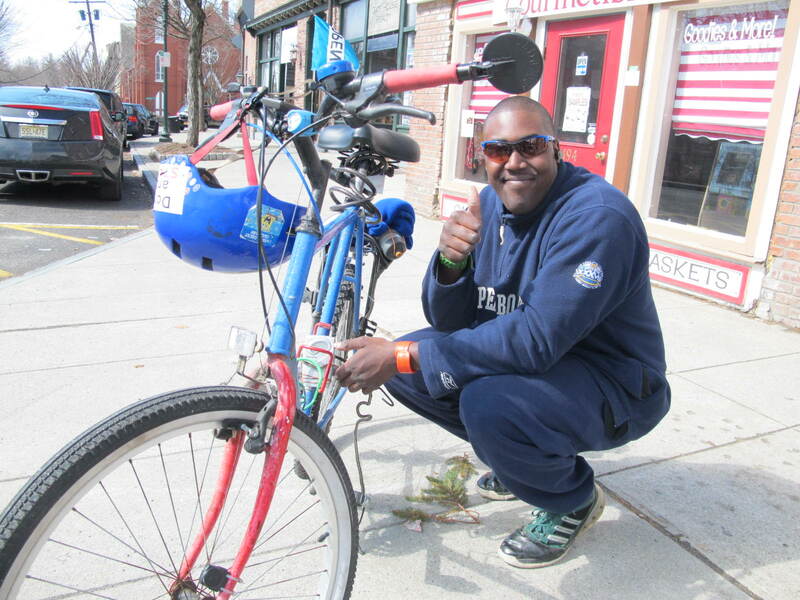 Even using the bike for every other trip to town results in gas and maintenance savings. Riding a bike saves us time. For local trips into town, the bike is hardly different timewise than a car after you factor in traffic and parking. 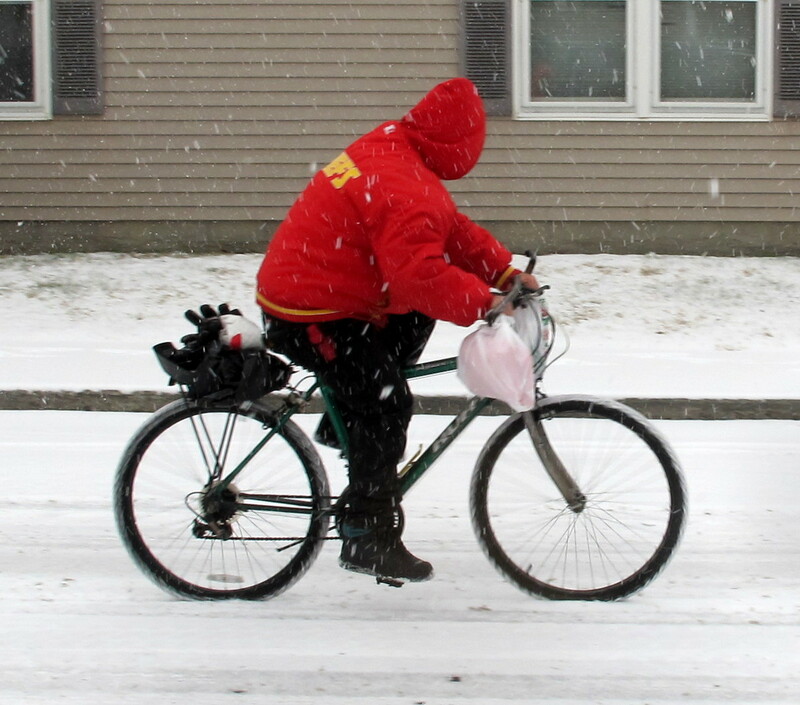 And unlike the driver of a car, bicyclists can multitask. Yes, we can remove the cardio/aerobic portion of our gym workout if we ride our bike around town regularly. And eat more ice cream. Riding a bike is fun and convivial. We can wave to our neighbor or pull over to chat with a friend. For errands in town, we have chosen the right tool—a bit of muscle power and 30 pounds of steel instead of 2,000 pounds of steel and 250 horsepower to go fetch a quart of milk and a loaf of bread, or even a week’s worth of groceries with the right accessories. Drivers, let’s take pride in our task and pay attention. Remember, driving is a responsibility not a right. Using hand-held cell phones is illegal (and studies show that hands-free use of phones is equally impairing to drivers.) We are all busy, but perhaps by freeing up our hands, we could find the time to use our blinkers. Let’s be patient with people who choose to bicycle or walk. Cyclists, we need to obey traffic laws and ride predictably. Riding on Main Street sidewalks is prohibited for people over the age of 14, and in general not a good practice on any sidewalk because we put ourselves at elevated risk when crossing curb cuts and side streets. Good bicycle lights are cheap, and required by law after dark, front and rear, and it is crazy not to use them. But the number one way to make cycling in Beacon even better is for more people to ride bicycles. Happy Summer! One Response to Beacon Bike Fridays! And if you can’t ride a bike, try walking! A lot more people walk in our area than other places; particularly in the south. If you walk in southern cities (smaller ones), it seems like people think there must be something wrong with you!